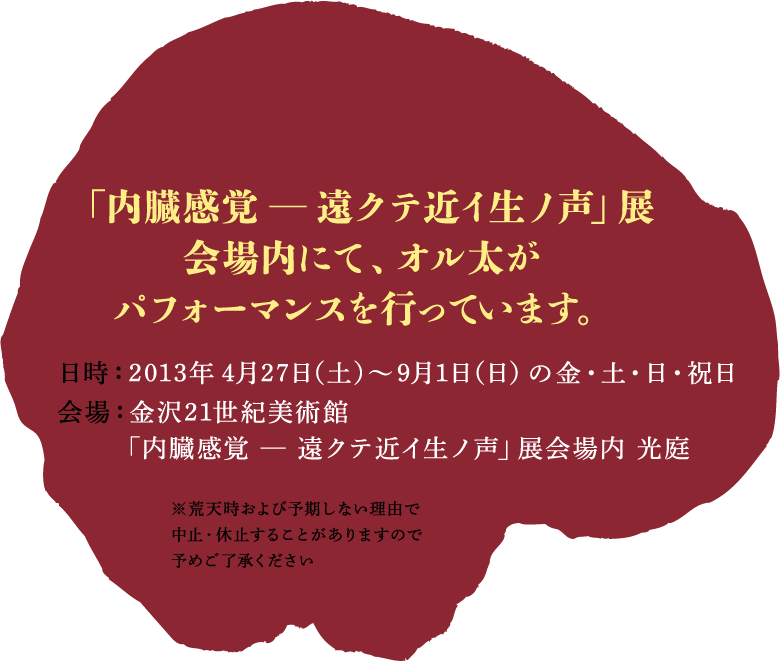 OLTA will offer performances in the exhibition venue throughout the exhibition period.
" I would also like to consider the art collaborative OLTA, which interprets the world of the ancient past in a contemporary context and gives thought to the future. Its seven members produce art on the basis of direct, physical inspiration taken from the familiar landscaps, nature, culture, customs, and festivals of their own suburban or rural district and the music, manga, and other sub-cultures they grew up with. Such works as Soil Shrine, where each member dances in the guise of a ceremonical “offering” on a shrine built of earth and straw, and Soil Spirits, in which the members transform into ancient haniwa clay figures, dogu figurines, and spirits and perform magical and comical movements, are still fresh in memory. While performing simple movements and engaging themselves - on a life-size scale - with such elements as “soil,” “indigenous,” and “ancient,” they endeavor to “connect” with their body rhythms and the rhythms in nature and the cosmos. In GENSHI Man - DOGU Man, a recent work concerning “the ‘primitive’ in the near future,” they employ performance as a means of returning to point one to consider the srtate of “life” for people in the near future. 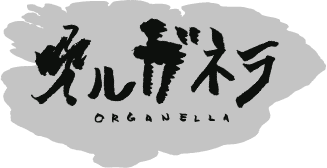 ORGANELLA, the work they are showing in the museum courtyard for this exhibition, is a composite of all their work until now, infused with life through performances. The work evokes ancient life, memory, and rhythms through life forms such as snails, water fleas, chickens, and cows, as well as internal organ motifs and even a soil layer containing contemporary garbage. The figures, while autonomous in themselves, interact in relationships that become a dynamic, swirling energy, like a vortex." YOSHIOKA Emiko (Curator, 21st Century Museum of Contemporary Art, Kanazawa), Resound Ye, Internal Voices. Hear Ye, Those Voices So Far, So Near. Catalogue “Visceral Sensation - Voices So Far, So Near”, 2013.